Yolanda García--Yo, for short--is the literary one in the family. Her first published novel, in which uses as characters practically everyone she knows, was a big success. Now she’s basking in the spotlight while those “characters” find their very recognizable selves dangling in that same blinding light. But turnabout is fair play, and so here, Yolanda García’s family and friends tell the truth about Yo. Her three sisters, her Mami and Papi, her grandparents, tías, tíos, cousins, housemaids, her third husband: they take turns telling their side of the story, ripping into Yo and in the process creating their own endearing self-portraits. 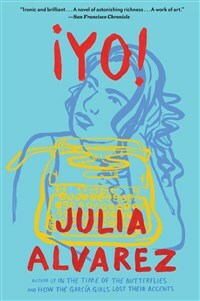 At once funny and poignant, intellectual and gossipy, lighthearted and layered, ¡Yo! is above all a portrait of the artist. And with its bright colors, passion, and penchant for controversy, it’s a portrait that could come only from the palette of Julia Alvarez. Julia Alvarez left the Dominican Republic for the United States in 1960 at the age of ten. She is the author of six novels, three books of nonfiction, three collections of poetry, and eleven books for children and young adults. Her work has garnered wide recognition, including the 2013 National Medal of Arts, a Latina Leader Award in Literature in 2007 from the Congressional Hispanic Caucus Institute, the 2002 Hispanic Heritage Award in Literature, the 2000 Woman of the Year by Latina magazine, and inclusion in the New York Public Library’s 1996 program "The Hand of the Poet: Original Manuscripts by 100 Masters, From John Donne to Julia Alvarez." In 2013, President Obama awarded her a National Medal of Arts. Alvarez has taught and mentored writers in schools and communities across America, most recently as a writer-in-residence at Middlebury College, until her retirement in 2016. For many years, she and her husband, Bill Eichner, ran Finca Fundación Alta Gracia, an organic coffee farm-literacy arts center they established in her Dominican homeland. She is a co-founder and convener of Border of Lights, a collective of activists committed to promoting peace and solidarity between the Dominican Republic and Haiti. In 2009, In the Time of the Butterflies was selected by the National Endowment for the Arts for its national Big Read program.